Much of astrobiology is concerned not only with what conditions life is thought to have emerged under and what environmental extremes it can survive, but also what sorts of hazards can threaten life on a planetary scale. And this pocket-sized book from OUP forms the perfect handbook to all the ways the world could end. Bill McGuire is professor of Geophysical Hazards at University College London and heads their Benfield Hazard Research Centre, so is certainly well-qualified for such doomsaying. 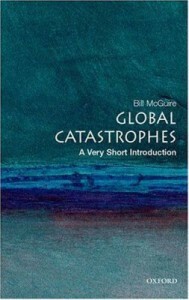 Natural hazards such as tsunamis, volcanoes, and earthquakes are all featured in early chapters. While all of these would be pretty unpleasant experiences if you were to be personally caught up in one, most such events simply don’t pack enough of a punch to threaten life globally. McGuire moves on to events lying in the extreme tail of more ‘everyday’ dangers, and discusses the hazard presented by thankfully-rare super-volcanoes. By injecting so much fine dust and sulphur dioxide into the upper atmosphere, such eruptions can trigger a volcanic-winter and truly alter the climate worldwide, potentially knocking the global biosphere. Long-term climate stability is also treated in a very fair-handed way. Chapter 2 deals with the current trend of global warming, whilst the following section summarises the opposite periods in Earth’s history: ice ages. Between them, these chapters address the crucial drivers and feedback loops involved in maintaining planetary climate stability. Also of great interest to astrobiology is Chapter 5 and the threats posed to planetary habitability by the cosmic environment. McGuire covers the hazards of asteroid and comet impacts, talking about the relative risk of strike and potential consequences posed by impactors of different sizes. Although this may be no consolation to the dinosaurs, extinction level events (ELEs) appear to occur only every 100 million years or so, and so you are over 300 times more likely to win the National Lottery than you are to be killed by a cosmic collision.